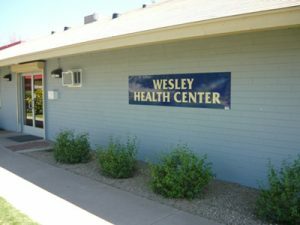 The Wesley Community and Health Center is one of the missions that Sun Lakes United Methodist Church supports. Since 1950, Wesley Community Center has provided programs and services to the residents of South-Central Phoenix. The building housing the center was reconstructed in 2010 after a fire and is now the location of the Wesley Health Center. This family practice health center, providing healthcare for both insured and uninsured patients is led by four primary care physicians and a staff of 30, assisted by medical students from the University of Arizona College of Medicine. The two other buildings house offices, a multi-purpose room, kitchen and an air-conditioned gymnasium.